Kashmir is currently under the grip of 'Chillai-Kalan' -- the harshest 40-day period of winter -- when the chances of snowfall are most frequent and maximum and the temperature drops considerably. Srinagar: Fringes of the famous Dal Lake and other water bodies in Srinagar -- the summer capital of Jammu and Kashmir -- have frozen this morning as the mercury continued its free fall and the city clocked the season's lowest night temperature. Srinagar recorded its coldest night this winter as the minimum temperature settled at minus 6.3 degrees Celsius -- marginally down from minus 6.2 degrees Celsius recorded the previous night, an official of the weather department said. Cold wave continued its record breaking spree in the city and this was for the fourth straight day that the minimum temperature has settled at minus 6.0 degrees Celsius or below. The fringes of many water bodies, including the famous Dal Lake, have frozen due to extreme cold conditions, which has also led to freezing of water supply pipes in many areas disrupting normal lives. The people in the valley are also facing problems with electricity supply besides extreme climatic conditions. Frequent power outages lasting a minimum of six hours in city areas and 18 hours in rural areas have become common. There is low discharge in water bodies, leading to low voltage, while many areas in the valley are completely without electricity as the damaged transformers have not been replaced. Though it ends on January 31, the cold wave continues even after in the valley. The 40-day period is followed by a 20-day-long 'Chillai-Khurd' (small cold) and a 10-day-long 'Chillai-Bachha' (baby cold). The meteorological department has forecast mainly dry weather over the next few days across the valley, possibly resulting in further drop in the night temperature. Meanwhile, Kargil town, in Ladakh region of Jammu and Kashmir, experienced the coldest night of the season so far as the minimum temperature there settled at minus 23.6 degrees Celsius, the official said. The town is witnessing extreme cold conditions. According to the official, the nearby Leh town also marked the season's lowest temperature at minus 17.4 degrees Celsius. Last night was also the coldest January night in the town in the last four years. Leh had previously recorded the lowest night temperature in the month of January at minus 18.9 degrees Celsius on 12, January, 2014. Gulmarg -- the famous ski-resort in north Kashmir -- recorded the minimum temperature of minus 8.6 degrees Celsius, a degree down from the previous night. The night temperature in Pahalgam -- the famous health resort which also serves as one of the base camps for the annual Amarnath Yatra -- increased marginally from minus 7.6 degrees Celsius the previous night to settle at minus 7.5 degrees Celsius last night. 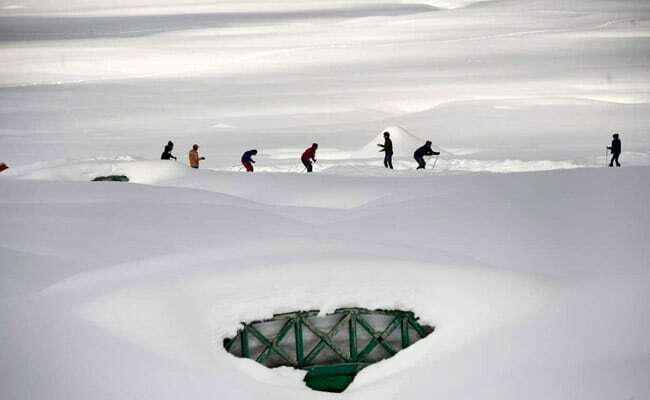 The night temperature in Qazigund in south Kashmir settled at a low of minus 5.4 degrees Celsius, while the neighbouring Kokernag town saw the mercury rise to minus 2.9 degrees Celsius compared to yesterday's minus 3.4 degrees Celsius, the official said.